yuck shock not a fan of po nor of these types of horror films but ty for posting extra reviews. 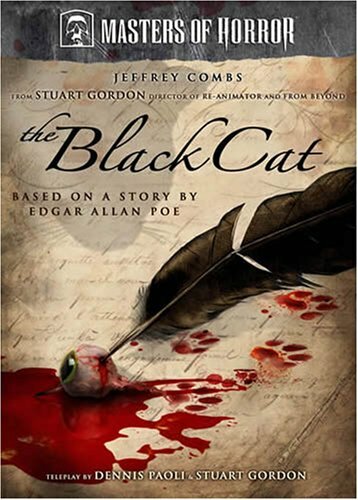 Yeah, if you're not a Poe fan, then you obviously won't enjoy this movie. Being an avid reader of Poe's myself, I loved it. And it's my pleasure to post horror reviews for these 2 weeks. Thanks so much for the comment, and for listening to Planet Macabre. I think you already suggested this movie on the podcast doctor. It was a few months ago if I recall. Highly anticipating the "Easter Horror" episode! The film I recommended on the Podcast was, indeed, titled THE BLACK CAT, but starred Bela Lugosi and Boris Karloff, and was produced in the 1930's. Despite the name of the film, that one had nothing at all to do with Poe or his short story (though that film's credits state it was 'inspired' by an Edgar Allan Poe story, the director came out a few years afterwords saying it was not). This is an entirely different BLACK CAT, made a few years ago for the MASTERS OF HORROR. A quick check of IMDB shows that there are no fewer than NINE movies titled THE BLACK CAT, so I guess it was only a matter of time before that title made another appearance on the blog! Thanks for checking into it, though. It at least gave me a chance to explain the differences. Have a good day, and thanks for listening to Planet Macabre.